Having a stressful job can increase the risk of developing asthma by 40 per cent, research suggests. Employees who find it difficult to leave their problems at the office are much more likely to develop the condition, scientists said. Their study indicates for the first time that work pressure can actually make someone become an asthmatic. Although most sufferers develop asthma in childhood, significant numbers are now diagnosed as adults. The research, from Heidelberg University in Germany, suggests stress at work could be one reason why. A team there tracked 5,000 men and women aged between 40 and 65 over eight years. They found that among those free of asthma at the start of the project, there was up to a 40 per cent higher incidence of asthma eight years later if they suffered stress at work. The signs were long working hours, demanding schedules and uncomfortable working conditions. The report, detailed in the journal Allergy, said: 'Our study suggests work stress and the inability to relax after work are associated with an increased risk of asthma.' Earlier studies have shown stress can lead to the release of chemicals that promote allergies and disrupt the way the body halts inflammation of the airways. The team stressed that the absolute risk of someone developing asthma because they are overloaded at work is still very small. 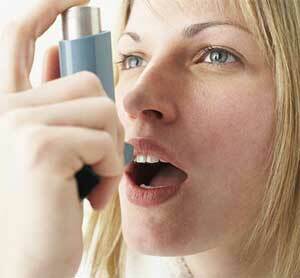 Around 5.4million Britons have asthma and 1,200 are thought to die from it each year. The annual cost to the NHS is around £1billion. The annual bill for the NHS for treating patients with the disease is around £1billion. At the beginning of the study, in the mid-nineties, each one was quizzed on their health and lifestyle, including whether they had ever suffered with asthma and how stressed they felt at work. Eight years later, researchers repeated the exercise and found that among those who had been completely free of asthma at the start of the project, there was a higher incidence of asthma if they complained of work-related stress. Volunteers who had developed asthma complained of long working hours, demanding schedules and uncomfortable working conditions. They were also more likely to complain of exhaustion and an inability to relax once they got home in the evening. Researchers stressed that the absolute risk of someone developing asthma because they are busy at work is still very small. But they said some people may suffer damage to the immune system that leads to the development of asthma. Previous studies have shown prolonged psychological stress can lead to the release of harmful chemicals that can promote allergies and disrupt the way the body halts inflammation in the airways. A recent survey by the mental health charity MIND revealed one in 11 British workers has been to see their GP due to work pressures during the recession.